Our Smocks are made from a durable Cotton and Polyester blend and will stand up to many washes. 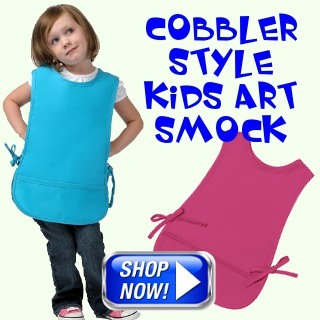 Unlike our competitors products our Kids Artist Smocks are MACHINE WASHABLE! These Artist Coats have one chest pocket and two side pockets so your little artist can carry all of their important Paint Brushes and Artist Tools. 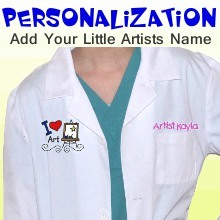 Don't forget to add Personalized Embroidery or a colorful design to make this Smock a very special gift to remember for years to come. 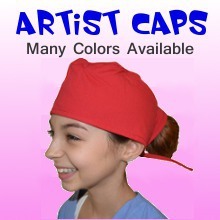 Kids Artist Caps are available to complete your artist outfit and personalized embroidery can be added for that special touch. 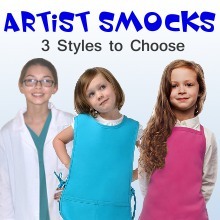 Our Kids Artist Smocks are authentic Smocks just like the one a real Artist wears. 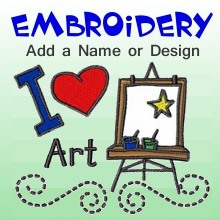 Many of our competitors sell "Artist Costumes" with inferior quality Kids Artist Smocks made out of a non-woven or non-cotton material that will come apart at the seams after the first wash. Our Kids Artist Coats are made from the same Quality material and stitching as a real Artist Coat, 60% Cotton and 40% Polyester. Yes Mom and Dad........they are MACHINE WASHABLE! Why buy a Artist Costume when you can have a real Artist Smock?